The Ausmus House is located on a dirt road about I mile southeast of Highway 63 in the Powell Valley. The house sits on a small knoll thus enhancing its antebellum grandeur. retained its original "L" shape with the inner portion of the "L" now serving as a patio area. In its early years the house settled on its northeast corner but the settling apparently has not caused any structural damage and the gaps have been well pointed. The house is different from other homes of similar vintage in the area because it has three doors in the front. Apparently this was part of the original design for the door going into the living room still shows the ax scars made by Union soldier to gain entry into the house. The wood on the first floor still bears the imprint of their horses' hooves. The house was built just prior to the Civil War. The present owners have sought to retain the anti-bellum integrity of the house. The rooms have been tastefully furnished and their original large dimensions retained. The only exception to this has been the widening of the opening from the back portion of the "L" to the main house. Also an iron spira1 staircase has been added to the back portion of the house. 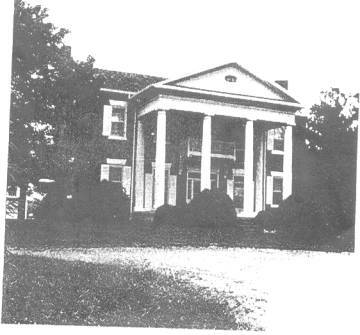 The Ausmus House is significant because it is the only brick antebellum home being nominated to the Register from Claiborne County. It is also significant because it is the only Kincaid home being nominated from Claiborne County. The Kincaids were a major influence in Powell Valley, particularly just prior to the Civil War. John Kincaid was one of i the first settlers in the Powell Valley arriving around 1800. His son, John Kincaid II, became a major slave and land owner. It has never been determined the source of John Kincaid II's wealth. It is known he minted his own money which contained more silver per ounce than the official U. S. currency. Tradition has it that he knew of a secret silver mine in Union County and thus secured his wealth from it. There are lead mines in Union County and apparently lead is often associated with veins of silver so there may be merit to the story. It was John Kincaid II who commissioned all the existing antebellum brick homes in the valley. The Ausmus home was built for John Kincaid II's son, John Kincaid III, in 1851. Slaves burned the brick and quarried the limestone base. There is excellent craftsmanship throughout, in the woodwork and particularly in the perfectly cut limestone. The Kincaids were strongly for the South in the Civil War. John Kincaid III was a Captain and apparently led renegade troops .through the valley after the war had ended. He was accused of killing a man named Vanbebber and thus had to flee with his family. He and his family died of cholera in Missouri. When he left, John Kincade III left his house to his brother Alvis. Alvis in turn sold the home to Jordan Longmire. Some of the older residents of the valley still refer to the home as the Longmire Place. Around the turn of the century William Ausmus acquired the house and its 150 acres. The property deteriorated under William Ausmus until his son, Frank, took charge. It was Frank Ausmus who added much of the present mechanical systems. Frank Ausmus died during the 1950's. The house is presently owned by the Welch family. 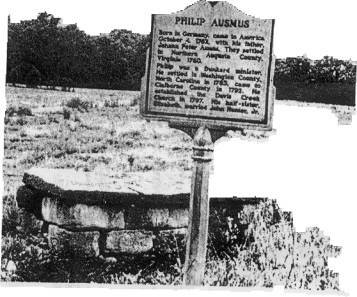 The grave of Phillip Ausmus and the historical marker at the site -located in a field near Davis Creek Church. After Benjamin Franklin Ausmus died in 1946 his widow Viola Wells Ausmus married John G. Farmer. Benjamin Franklin Ausmus was the son of William Thomas Ausmus and Mary Jane Carr. Rootsweb database with more information on The John Kincaid’s. Builders of the Frank Ausmus Home. Back to Joe Payne’s Genealogy Page.